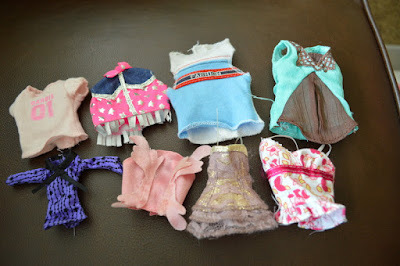 The Barbie Blog: Clothing Extravaganza! Well, the post that has been a long time coming. All the clothing that was a great garage sale find from my dad. Thanks Dad! :) This is from back in October. As I said, a long time coming! I'm going to need some ID help Barbie friends! Let's have a look, shall we? SHOOOOOOOES! Holy Smokes, look at all this accessory goodness? ...chunky Mary Janes and booties. What a haul! And I was very surprised at the small amount of non-mates. Dang. There are some cool ones in there too. 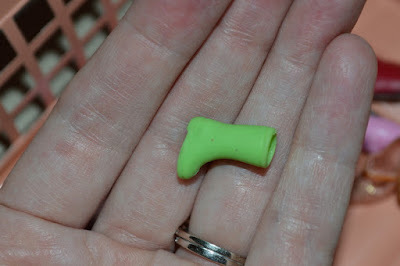 I was puzzled by this extremely tiny rain boot. So cute! Anyone know a doll that would fit this small shoe? Also included was this assortment of other miscellaneous accessories. 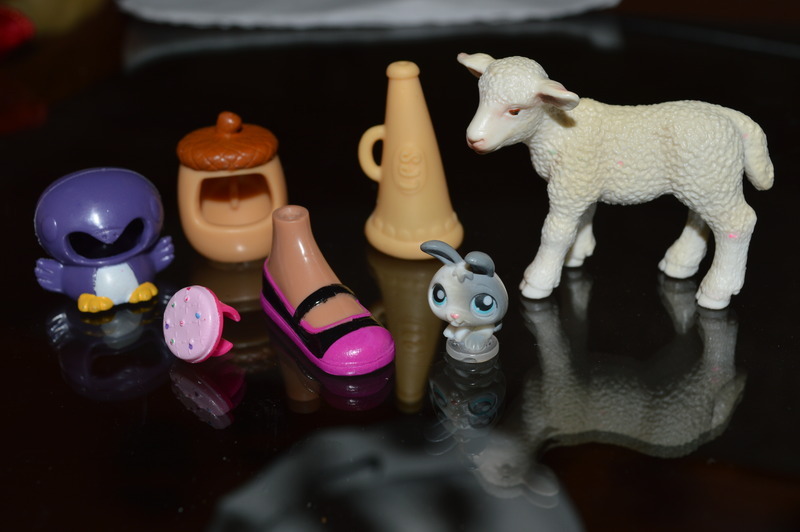 Items such as an acorn helmet, a cookie bracelet and a lamb. Now for the awesome dresses! Some of them I know of but some I'm definitely going to need some help on friends! This beautiful Christmas cape. 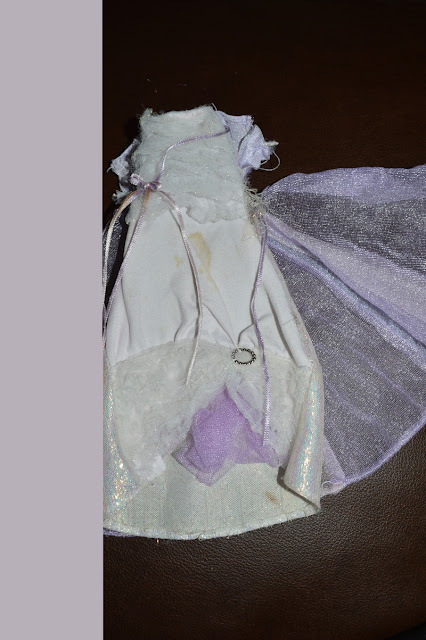 I'm not sure if this one is authentic or OOAK but it's pretty either way. A pretty pink dress with printed feathers. 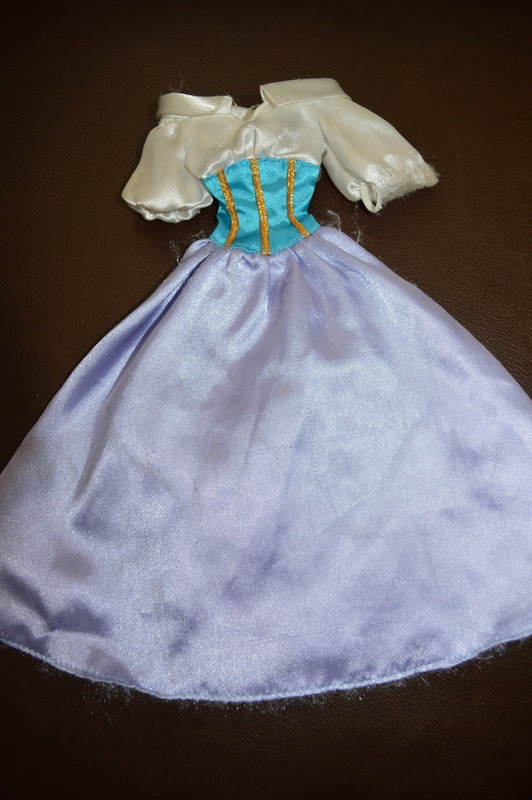 Some kind of princess doll? This cape might be OOAK. 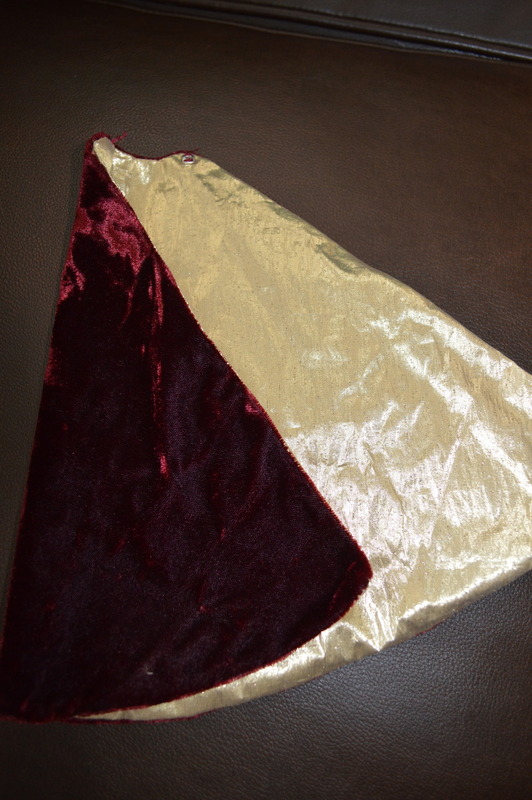 Pretty Burgundy and Gold. 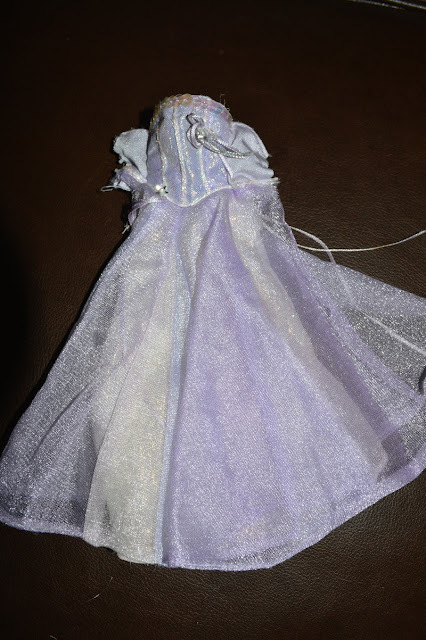 This one looks like the dress from Princess Aramina from Barbie and the Three Musketeers. But I'm not sure it's the right one. I might have this one somewhere. 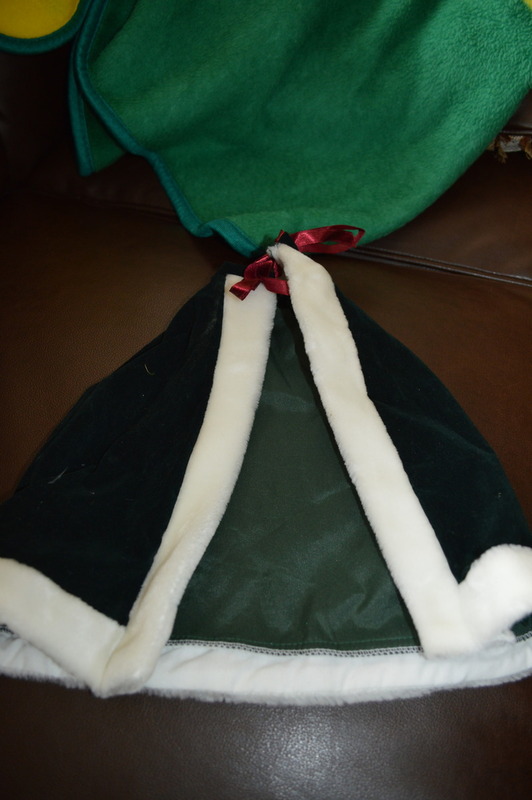 And the purse came with! 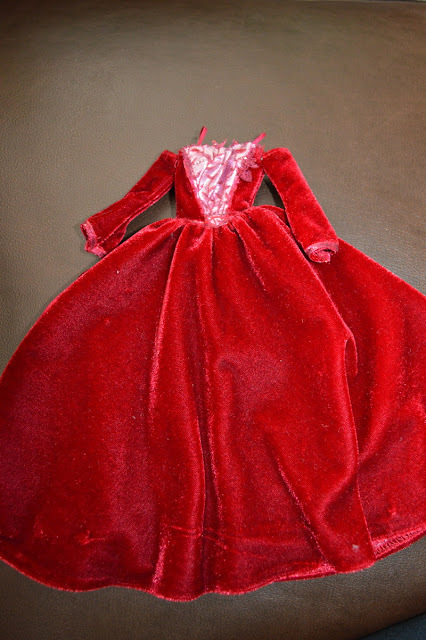 The most beautiful dress from the 1991 Happy Holidays Barbie. I have her! And another one! 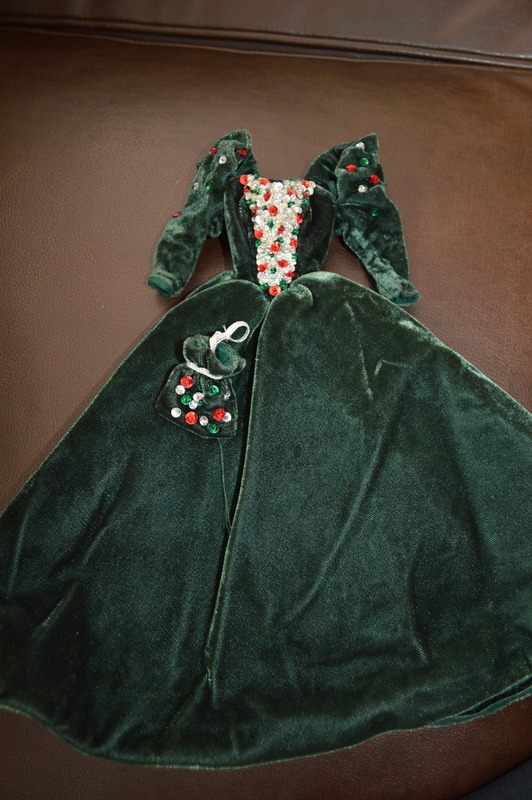 This one from the 1997 Happy Holidays Barbie doll. 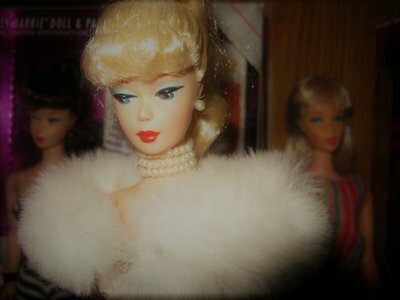 I even have her in a spare doll that I picked up at the thrift store years ago. Nice! And this one (I think) is from the 2002 Holiday Barbie doll. I'm loving all of these dresses in awesome condition! This one looks familiar. I think I have this one...maybe? Almost like a Sleeping Beauty type dress. Not really sure if this is a strapless dress or what. They've been packed away so long so I can't remember. Love the color though! Oh right! 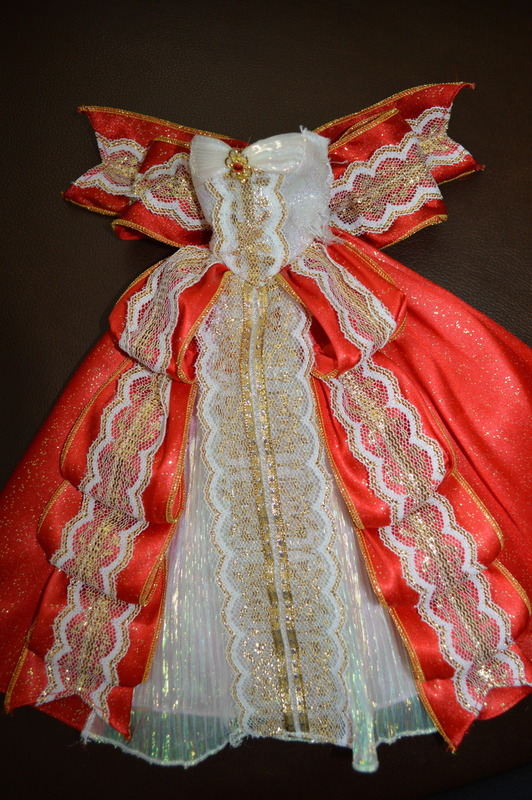 This one is definitely from some doll that can turn from princess to bride just with a flip of the dress! 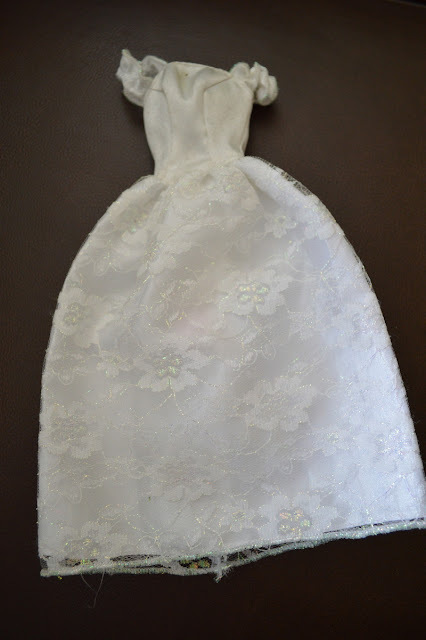 This is the wedding dress side. I apologize for this photo. 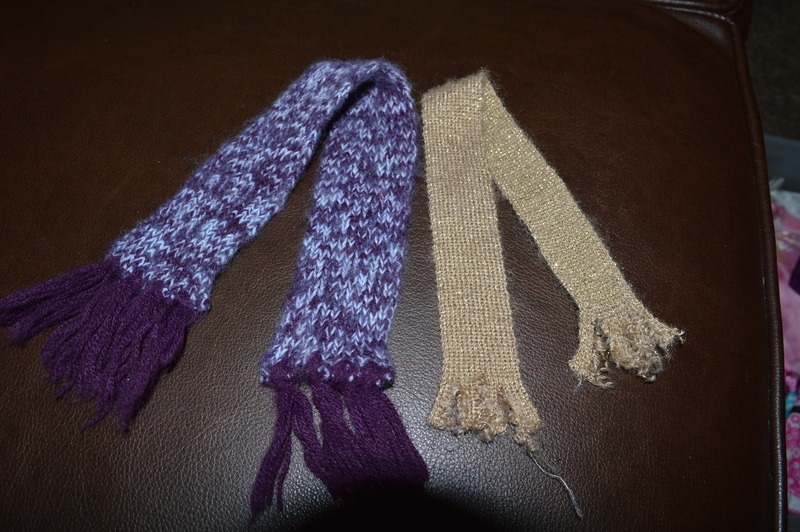 Not sure how the purple stripe ended up on the side. This is definitely an Aurora dress. 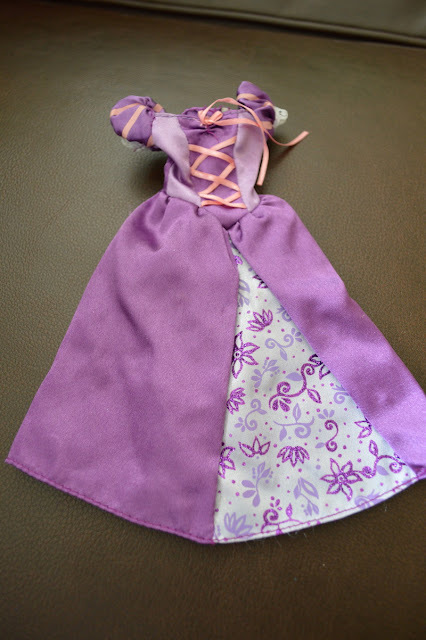 And another Aurora dress. This one might be from the Sparkle Princess line. I have this one. 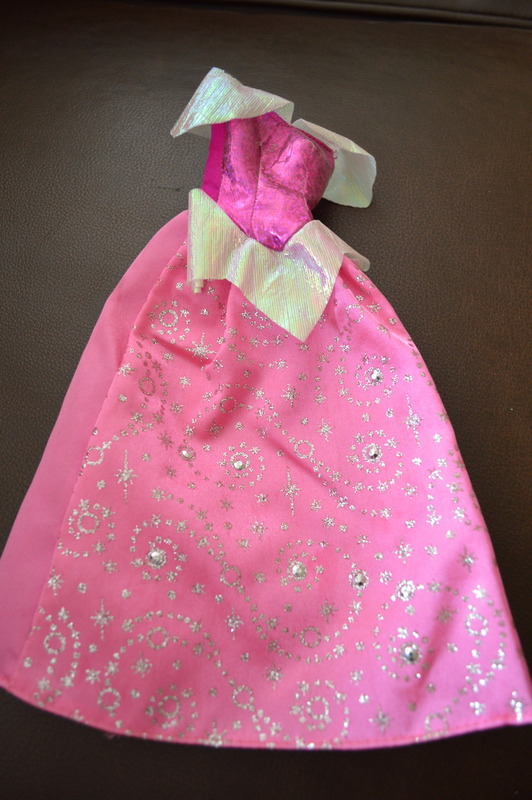 :) The dress of Rapunzel from Tangled. 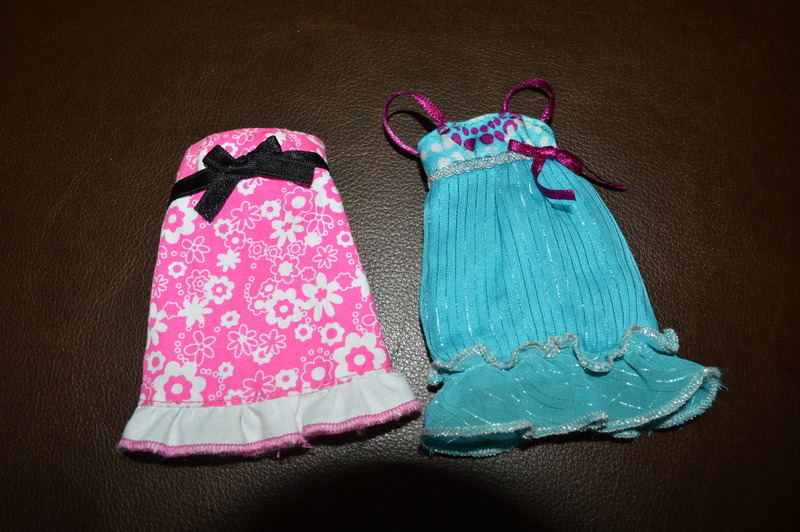 Here are a couple of form fitting dresses. I like the red. That one is definitely going to be a candidate for going on a doll. A couple of short casual dresses. Both are super cute! And that is all for the dresses. Now we have some skirts! I know I have the green sequined skirt. I love the middle one on the bottom row! 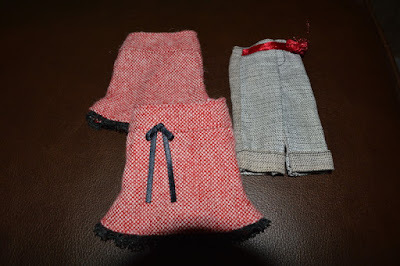 Here are a couple of tweed skirts and a cute pair of capris. Now for the tops! The second from the left, bottom row might go with the petal skirt in the above photo. Cute little western shirt in the mix! 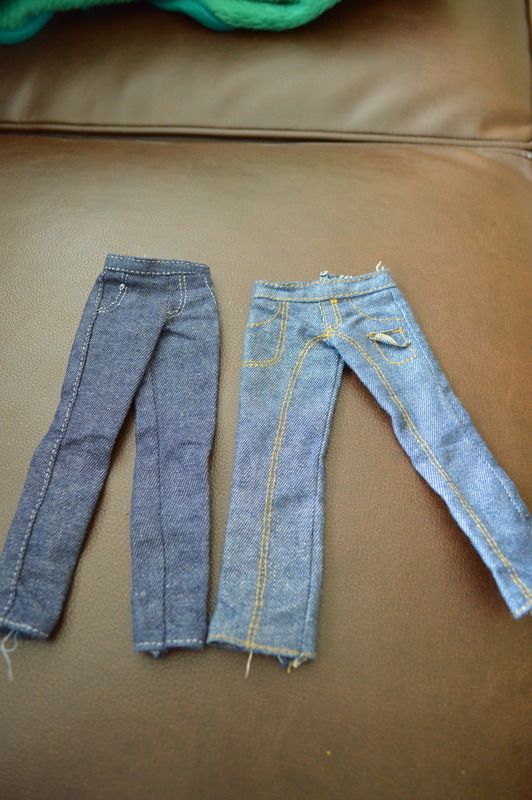 Next, two pairs of jeans. 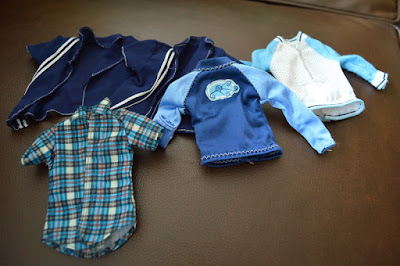 And we also had some clothes for Ken! 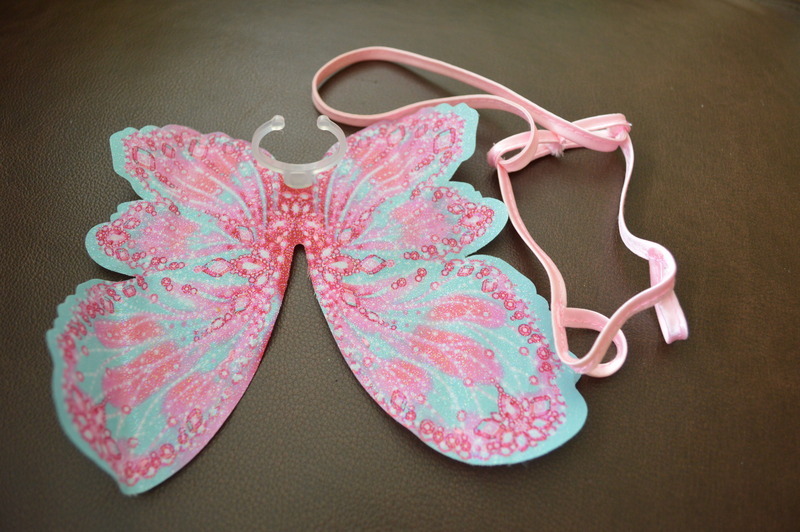 Also included was a pair of wings and a little harness type-thingy. Maybe the wings go with the petal shirt and petal skirt? 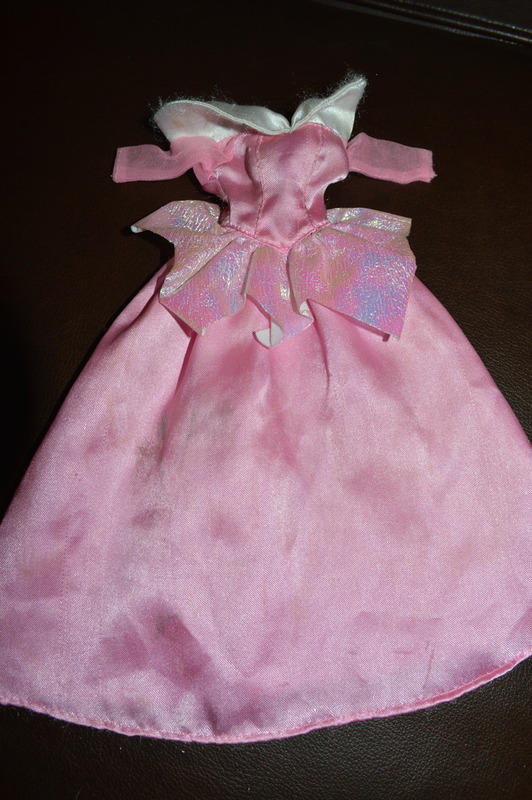 Just not sure what doll it is! And some misc clothes. 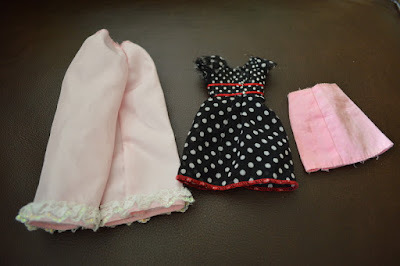 A pair of bloomers that look to big for Barbie, a dress and simple pink skirt. Accessories! I love the belt, I'm sure I can find an outfit for that. Also a stole and a towel. And that's it! Any help would be much appreciated! Next time I'll have some new additions to the group that I'm sure you're going to love! The Sleeping Beauty type dress belongs to Esmeralda from The Hunchback of Notre Dame. That tiny green rainboot might fit the Topper Dawn dolls. Fantastic group of footwear and clothes! 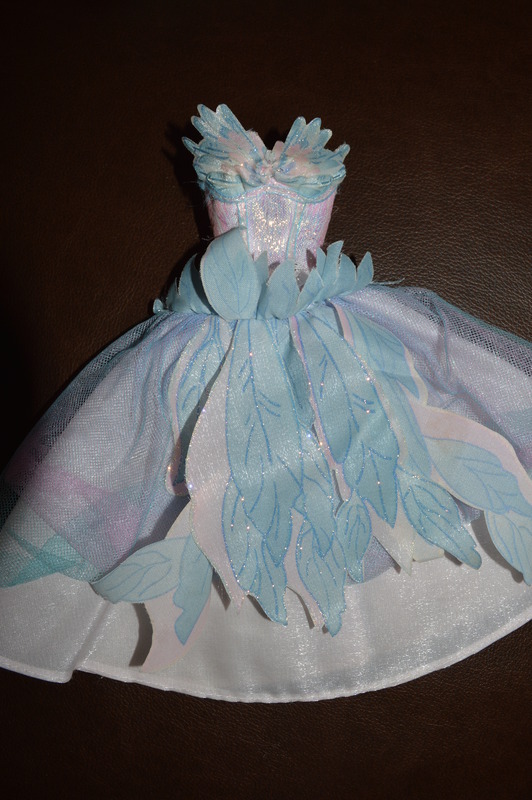 The one with the printed feathers is Barbie Swan Lake. 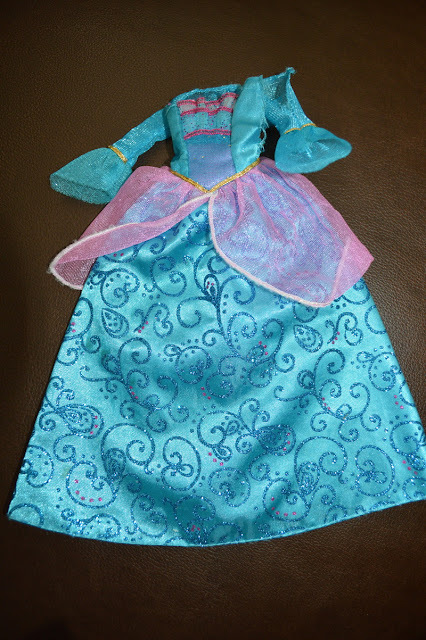 The Princess Aramina is actually Barbie the Island Princess Doll. Purple MH top is for Twyla. The reversible dress is from Princess Annika from Barbie and the Magic of Pegasus. 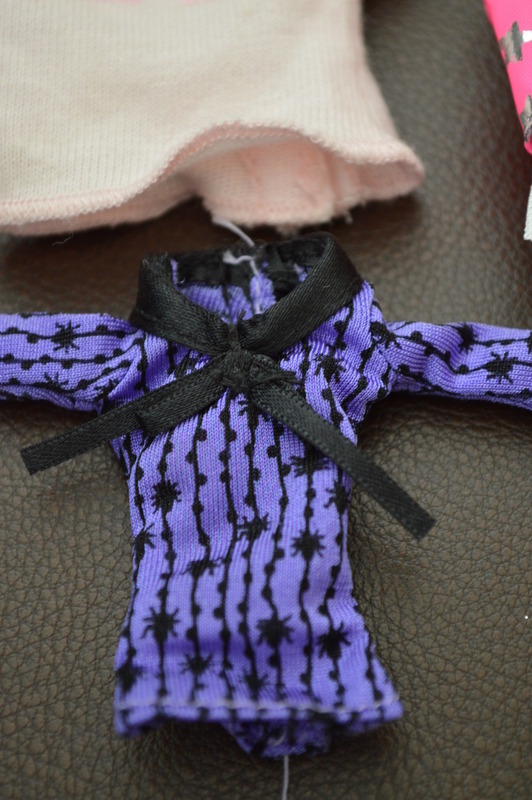 The small purple shirt with spiders is from MH Twyla (basic doll). What a loot, congrats! Don't you just love a major shoe loot like this? 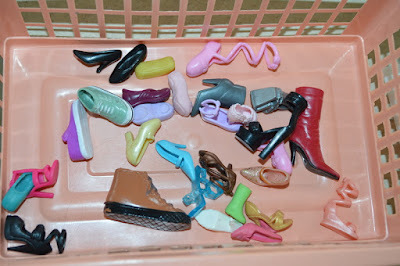 The tiny green boot might belong to some Polly Pocket Doll, probably from a horse riding set. 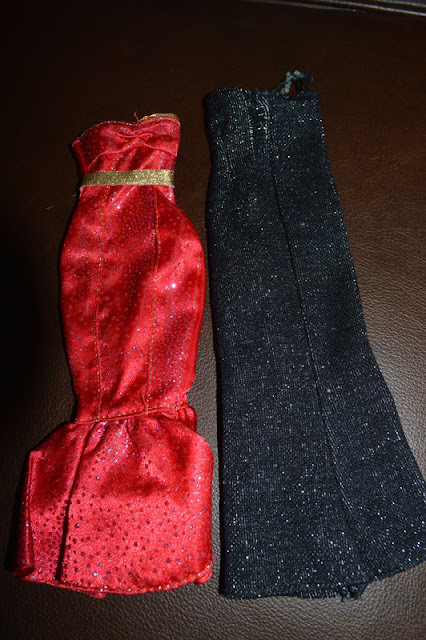 The two short dresse are from the Fashion Fever Line. 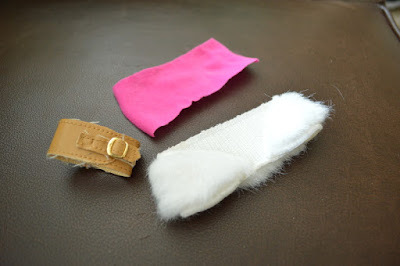 The pink one belongs to Fashion Fever closet # N4856. The blue one was a single carded fashion # M9343. Skirts picture: the green sequined skirt is from Fashion Fever closet # L3393. The multicolored ruffled skirt belongs to Fashion Fever Mannequin # J1401. The polka dot skirt with the pink bow is rom Fashion Fever closet # N4856 as well. The denim skirt is from Fashion Fever closet # N4858. The tweed skirts and the denim Capri pants are both from Fashion Fever closet # L3392. No Idea on the jeans though. WOW, thank you ALL for your wonderful help with these ID's! 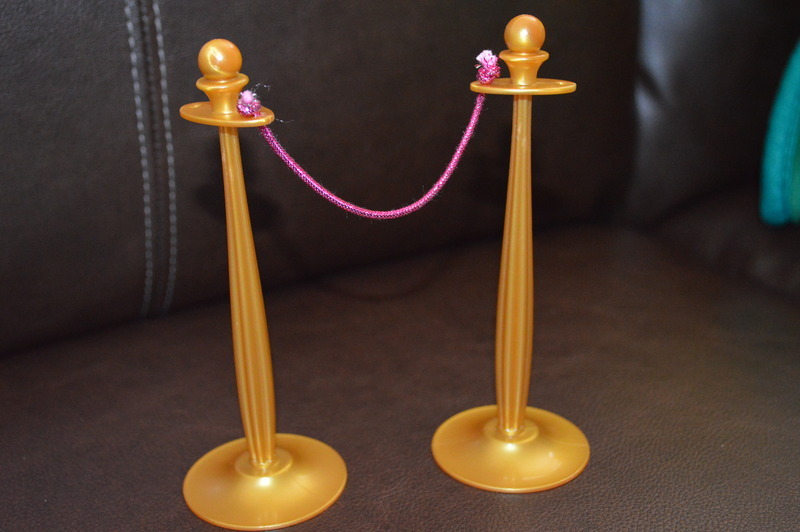 Funny to see that I have the complete set for the Barbie ICB movie star, that's where the rope divider comes from. :) I'll post pics when I have them on dolls! What's New in Barbie Land?